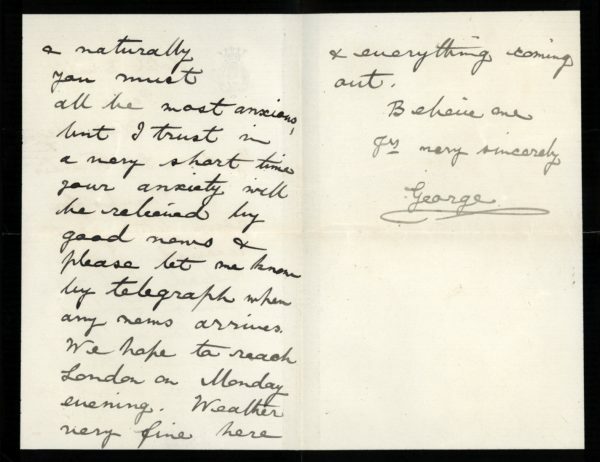 Autograph Letter Signed ‘George’, to Sir Francis de Winton, expressing sympathy over his correspondent’s anxiety about his son in Uganda, asking to be informed by telegraph of any news. 3 pp. 6 x 4 inches, on his own writing paper bearing a monogram G upper left. In very good condition, black borders. Hotel Bristol, Paris [c.1892]. King George V (reigned 1910-1935). Sir Francis de Winton (1835-1901), Comptroller and Treasurer of the household of the Prince of Wales.